The only time I had South Indian food was when I was staying in Dubai. I had a bad impression of it at the very first time. It was very sour. Second and third impression was also as bad. They use a lot of tamarind in foods like Idli, Dosa, Sambar etc. I heard it many times from many friends and relatives that all South Indian foods are not as sour as I think they are. The foods I had was mostly cooked by Keralite people. There are so many variety of foods and preparations in South I never knew. In my city, Kolkata, South Indian food is equally popular. But, what I get here is nowhere near to what I had in Dubai. 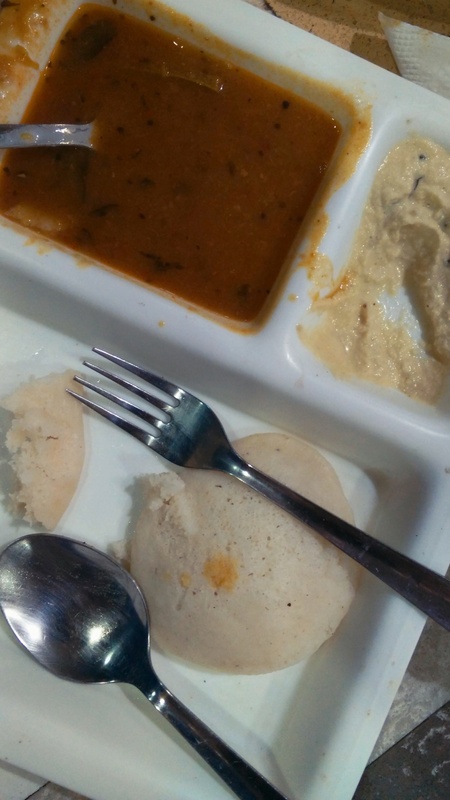 Sourness is very little in preparations like idli, dosa or sambar. Sometimes I get a sweet taste. I guess I can get the same taste in Chennai or Kochi as well but I just had it from the wrong place! Today we had a good lunch at food court. All foods from South Express. A plate of Dahi Vada and a plate of Idli. I am a South Indian dish fan now. I mean why not? I learnt one thing from this. No food is bad. You need to keep trying them from different places untill you find the perfect one.